Hope you had a wonderful and relaxing long weekend. Yesterday, I went to a Memorial Day service, and it was a meaningful reminder of the ultimate sacrifice the men and women of our country have given for our freedom. One thing the speaker talked about was WWII pilots and the extremely high casualty rate, and the extreme conditions inside the plane during battle. He also talked about the mid air crashes - as each of the planes circled to wait for the entire fleet of planes to take off and join the group for their mission. It was a mini history lesson - but more importantly I learned more about the sacrifices of the men that serve. The service reminded me that this weekend is not all about the "start of summer" or the great deals - but something more important to take the time to remember. 1. This fun sundress. I bought it in petite for a shorter dress. 2. I've joined the jumpsuit trend - and I'm going to give this one a try. 3. A classic LBD - little black dress. 4. This fun little white button down dress. Hopefully, I like it. 5. My favorite jeans - in a shorts version. I’m not sure why this dress is called “ditsy” but I think it’s cute. I like the longer denim trend. This floral dress would be perfect for a summer wedding. This striped jumpsuit is one of my favorites for summer. A perfect summer tee that is under $20. This ruffled wrap dress is on sale for under $40. This is a cute tweed button front skirt - is on sale! This cute plaid bikini top is only $19! This blue and white striped pattern is one of my favorites. This swimsuit almost has a “historic” print. This moto jacket has the softest leather and it’s 40% off. This mixed striped sweater would be a great for cool summer nights. Ooooh I love the dresses you bought - especially the black wrap! I didn't buy anything during the sales, I'm trying to behave but it is so tempting! I am so impressed you did not buy anything. I LOVE the little smocked sundress you got. Pilots especially during the war amaze me. What a wonderful service and I hope you have a great day today! I hope I love the smocked dress as much as I do online when I get it - we'll see. 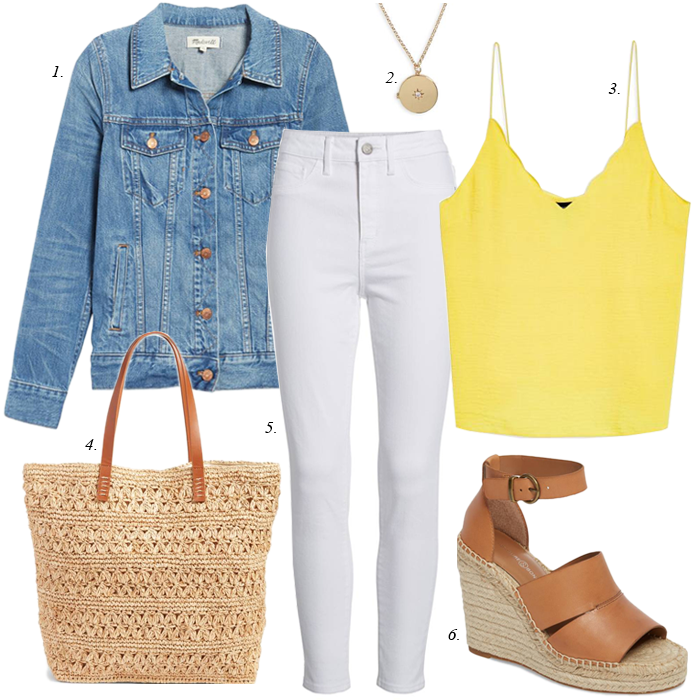 Love those espadrille wedges, they are definitely the latest trend! They are definitely one of the best summer trends! These things are so nice. I love the yellow cami. Thanks. I love it, to. I am glad that we take one day to remember all of our service men and the sacrifices that they have made for us. It truly is a special day. It sounds like you picked up some fun stuff, and I cannot wait to see the Loft jumpsuit on you. Thanks! I really hope I like the jumpsuit as much in person, as I do online. Ohh! Perfect picks for summer! Ah, I was thinking scatterbrained as a person - but a small scattered pattern makes sense! Thanks.